His works grow out of guns to become much more than that. A presentation of his sculptures together with his drawings in one of the large rooms of, say, PS1 could clarify the broader view of the artist. Rob Perrée on the work of the American artist Roberto Visani. Weapons in art or weapons as art is not a new phenomenon. In Western Renaissance paintings weapons were used in a symbolic sense. The devil was often the object of this symbolic imagery. 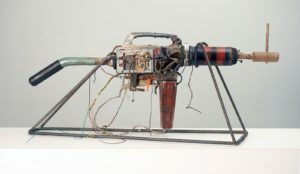 Contemporary African artists use guns that are left behind after violent conflicts or civil wars. Goncalo Mabunda from Mozambique is the most known representative of this kind of art. Like many others after him he turns guns and other weapons into recognizable objects or even utensils like chairs and benches. His main purpose is to disarm the weapons, to make them harmless and safe by making them useful or beautiful. By doing that he protests against the meaningless violence they symbolize. The fact that it fits an African tradition to use found material to make art is not more then an indirect and subservient aspect of his art. Roberto Visani grew up in a small town in South Dakota with mixed race parents. Guns were already at an early age part of his daily life: his father was fascinated with the military world and hunting was one of his hobbies. Visani’s perception changed dramatically when he found out in Ghana – a Fulbright Fellowship brought him there in 1999 – that slaves were exchanged for weapons during slavery. He also found out in a military museum there that soldiers personalized their weapon by attaching all kinds of decorative elements to it. A way of disarming it without loosing its function. For Visani all these and other mixed and contradicting connotations make the gun a challenging tool to work with. It can be a toy, a phallic symbol, an object that has more value than a human being, an object to destroy human beings, an object to question power, to question the ways to solve conflicts, an object to dominate the other, to intimidate other people, to protect yourself or an object to be just an object. All together a box full of ingredients to tell exciting, uncomfortable or humorous stories. That’s what Visani does with his sculptures. He tells stories. Most of the time a gun is the starting point of a new work. Then he adds all kind of found materials to it. There is no limit to them. It can be a piece of wood, of underwear, of metal, of furniture, of a doll, of a tool. It can be feathers, glitters or a plastic flower. It can be an element that does not show its source, that does not want to be identified. They have one thing in common: they all have a history. They get a new life because of the new context the artist puts them in. The process of adding is not the outcome of a specific plan. The result has to be as logical as surprising. It has to have a story in itself, for instance a story that is reflecting on the world the artist lives in, but it also has to have the openness a viewer needs to create his own story. Sometimes he presents these works as an installation. By doing that he increases the storytelling-potential. I like it when an artwork has content, has something to say, but the sculptures of Roberto Visani have a strong formal quality too. They are also about balance, about being solid but looking vulnerable, about parts that look as if they are forced on each other because they don’t like each other, about spatial effects, about dimension, about impact. His (rare) cardboard sculptures illustrate that, but his recent iron works make that all the more clear. The bumpy iron forms are moulded, they have the imprint of a gun but they don’t have the form of it. They are put together as a house of cards. As if they can collapse any moment. In fact they are solid and heavy constructions that can handle resistance easily. In these kinds of works formal aspects predominate substantive aspects. 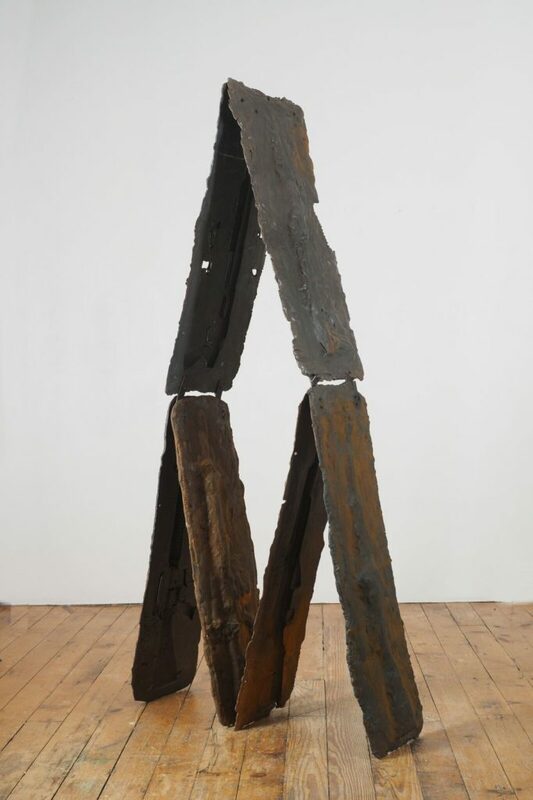 Some of Visani’s sculptures remind me of the works of the Cherokee Indian artist Jimmy Durham. However, he assembles recycled ánd manufactured objects. That is why his sculptures are more figurative. In his works formal aspects are subservient to the narrative. 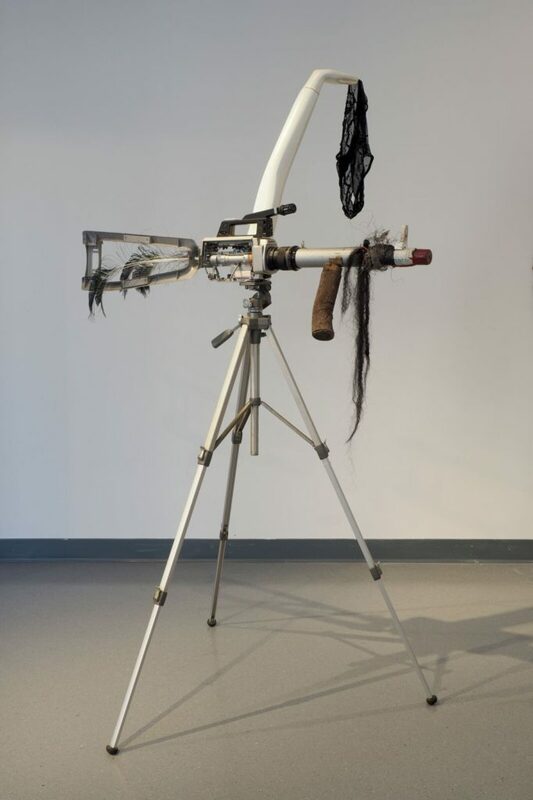 The sculptures of Roberto Visani have a political layer, for sure, Jimmy Durham however is an activist, an artist with a political message. For long he did not want to exhibit in the US because of the intervention of the US government in Central America. Roberto Visani also makes collages. He calls them drawings, probably because of the basic material – paper – and of the directness these media have in common. At first sight these works seem strangers in Visani’s oeuvre. They are not. 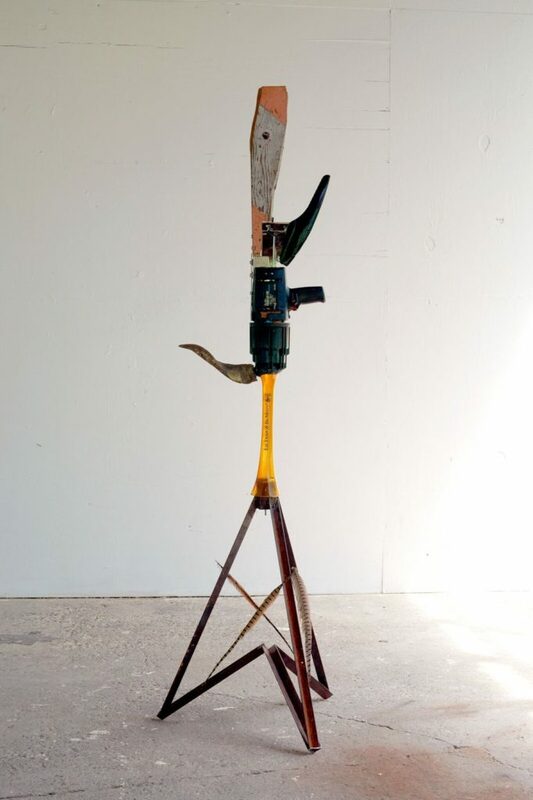 The way he assembles his sculptures is comparable to the way he puts his collages together. He glues a found piece of paper on a paper surface. 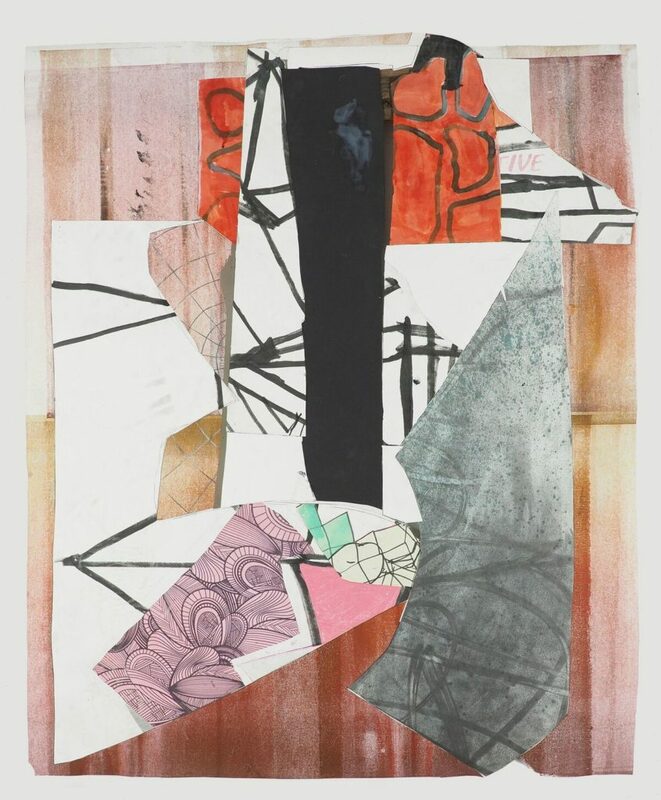 That can be a leftover piece of a copy print, a leftover piece of a drawing or a piece out of an earlier collage. He adds other pieces of paper to it, without a plan, intuitive, accidental. He layers them to create the suggestion of depth. 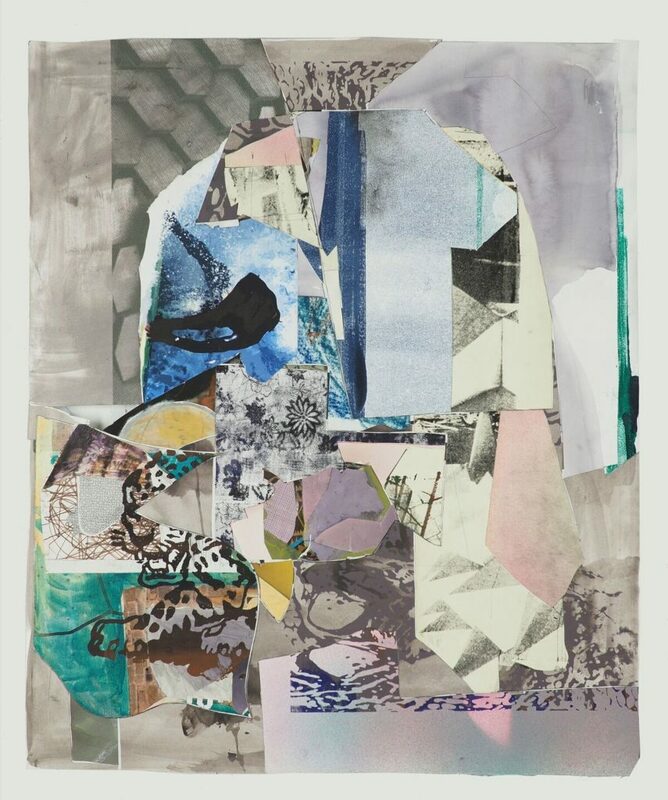 It is possible that he paints over parts of the collage, that he adds some words to it, that he makes a hole in it, that he roughens the edges. The colors are retained, as if Visani does not want to disturb the symphony of forms: pieces overlapping each other, touching each other, contrasting with each other, reinforcing each other. Like his sculptures, the result looks natural but at the same time it is puzzling, surprising and open for many interpretations. The overall view is abstract, but if you look closer you will find several figurative elements. They are there to trigger the fantasy of the viewer. The sizes of the collages vary. His ultimate goal is to make wall-size collages. He wants the viewer to be in is work, as if he is part of it, as if he is a piece of the puzzle. Most of the time Roberto Visani is asked to participate in exhibitions with his gun works. Guns have a high sensation factor especially in a time where wars and fatal shootings tumble over each other in the news. However, a pure gun based selection does not justify the intentions of the artist. His works grow out of guns to become much more than that. A presentation of his sculptures together with his drawings in one of the large rooms of, say, PS1 could clarify the broader view of the artist. Rob Perrée is art historian, independent writer and curator, founder and editor in chief of Africanah.org, lives and works in Amsterdam and Brooklyn, New York.